"I have made this several times for guest's of mine, and they have all loved it. 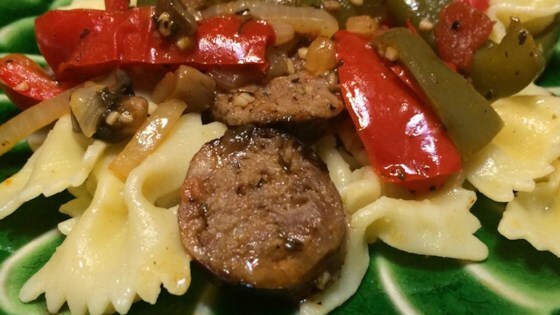 It's a great Italian dish that doesn't require a lot of work." Place whole sausages and 1/3 cup water in a skillet over medium-high heat. Cover, and cook 5 to 8 minutes. Drain and thinly slice. Return sausage to skillet. Stir in garlic, onions, peppers, and Marsala wine. Cook over medium-high heat, stirring frequently, until sausage is cooked through. Stir in diced tomatoes, black pepper, and oregano. Cook about 2 minutes more, then remove from heat. Serve over cooked pasta. This is addictive. My husband ate all of it in a day. I will make variations on my noodles next time. It was really good! I did use more Marsala sauce as suggested and 1/4 cup of spaghetti sauce..and of course more garlic.. This was excellent. Very delicious.